In which I discuss our practice of living simply in the greater St. Louis, Missouri metropolitan area. As part of my work to encourage readers to learn and use the scientific method in practical endeavors like gardening, I discuss and interpret a test I devised to answer a question I asked the garden in 2018. It has it all – the original question, a belated realization that the design was flawed, difficulties experienced when I attempted to perform the experiment and the necessary re-boot, and the results that I got and what little I could learn from them. Read on to find out what I did and what all of us, including me, can learn from it! For the past several years, I have tested the re-mineralization program described by Steve Solomon in his book The Intelligent Gardener. 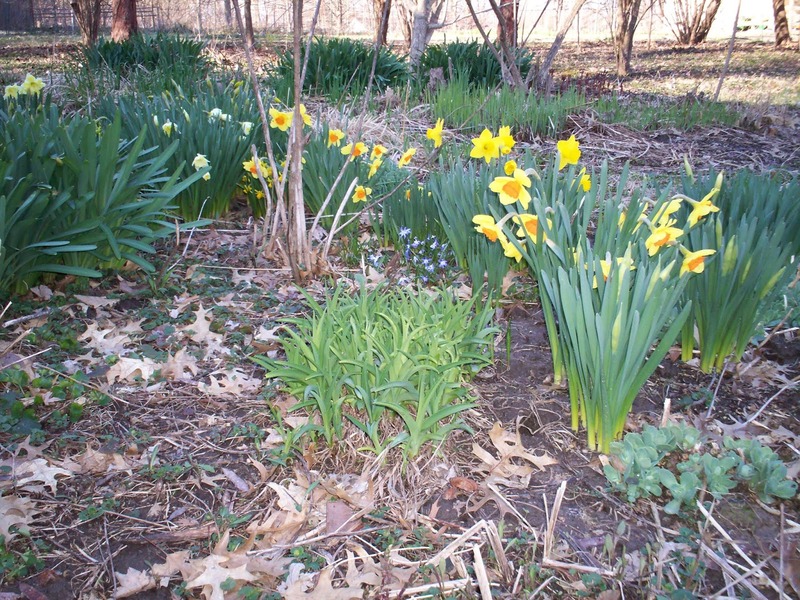 This post from 2013 describes my garden soil at the beginning of the re-mineralization program and the materials I added to it that spring. 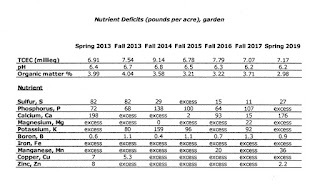 Since then I have been taking soil samples and, using the most current worksheet (available here), determining which minerals in my soil are deficient and which are in excess. The figure below shows each year’s excesses and deficits in minerals. The units for the deficits are pounds per acre. Each year from 2013 through 2017 I added a nitrogen source (seed meal, which soil bacteria eat and excrete as nitrates that the plants can use). The nitrogen source ensures that there is sufficient nitrate in the soil for good plant growth; the compost I add isn’t high in nitrogen and we do not keep livestock whose manure could be used for this purpose. The soil tests showed phosphorus was deficient each year, so I added soft rock phosphate to supply that macronutrient. Most years I have also added a source of sulfur (gypsum), calcium (lime, oyster shell, and/or gypsum), potassium (potassium sulfate), and boron (borax) to remedy deficiencies. When the soil test indicated a deficiency, I added mineral forms of manganese, copper, and zinc. After the 2017 growing season, with five years of garden data to hand, I had proven to my satisfaction that the re-mineralization program produced much better results than did my attempts to follow the Ecology Action program. 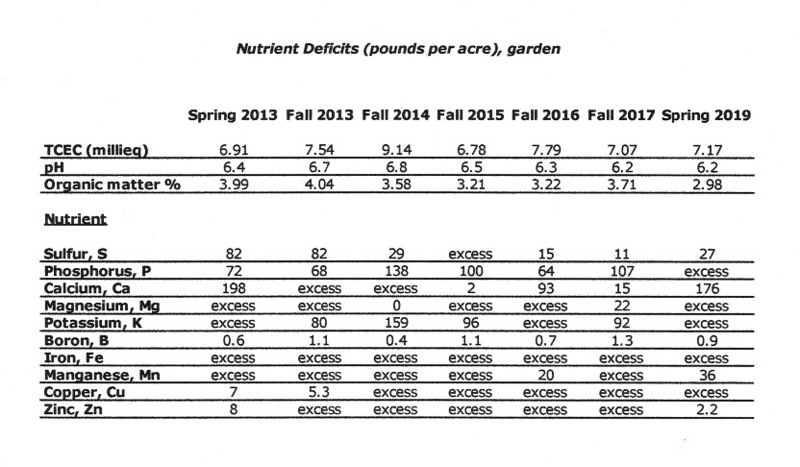 The garden data from 2017 shows that the majority of the best yields for each crop and variety occurred in 2013 or later, even though most of the crops were grown at wider spacing than I had grown them before 2013. Then I looked at the data in the figure above through the fall 2017 soil sample and considered what it told me about the soil and how it had changed over the years. So far I had needed to add multiple minerals to the soil each year, in accordance with the low TCEC of my soil (meaning I could not keep a large supply of those nutrients occurring in positively-charged forms – everything from calcium down in the figure – which is due to the low clay content of my soil). I also needed to add the negatively charged minerals, sulfur and phosphorus, which are associated with the organic matter in the soil. Because we have a hot, humid summer which includes rain during the entire growing season, it is difficult to keep a high level of organic matter in the soil, and thus difficult to hold onto these minerals over time. I would add more compost to raise the organic matter level if I could make more of it, but so far I have not been able to do so. Since I thought I would need to continue adding some minerals each year unless and until I could raise the TCEC and the organic matter level of my soil, I wondered if there were other substances I could use to re-mineralize the soil that I could source for myself, rather than having to purchase them. While cottonseed meal, soft rock phosphate, gypsum, and potassium sulfate are still readily available and cheap, all of these materials come from someplace else. The rock phosphate and potassium sulfate are both depleting. If natural gas supplies become constrained, so will the supply of the ammonia used for fertilization on commercial non-organic farms, because natural gas is used as the hydrogen source in the Haber-Bosch process that produces ammonia. In that case seed meals may become a substitute nitrogen fertilizer for commercial agriculture, which could prevent me from obtaining it or raise the price past what it makes sense for me to pay. The first material that came to mind as something I can source was wood ash. Whenever we burn wood in our wood stove we generate wood ashes, which we store in a metal trash can to keep any live sparks that could start a fire away from combustible materials. By spring 2018 the trash can was almost full of wood ashes. In order to be able to put ashes generated in the following winter into the trash can, we needed to do something with the ashes already in it. At about that time, the Missouri Extension published an article on recycling wood ashes as a garden amendment. While their opinion was that it was best used to decrease soil acidity (Missouri soils tend to be acid due to rain during the growing season), they also mentioned that it could be used to supply potassium and phosphorus, and they provided an average analysis of P (phosphorus), K (potassium), and Ca (calcium) for wood ashes: 0.9% P, 5% K, 23% Ca, and 2% Mg (magnesium). With this information I could calculate how much of my soil’s needs could be supplied by wood ashes. I had another material in excess which contains some nitrogen (N) and P: worm castings from the worm bin. While I use worm castings in the potting soil I make for seedlings and container plants to add N and P, the worms produce more castings than I need. With this material also needing to be made use of, I searched the web for analyses of the nutrient content of worm castings. The best I could determine from the web search, worm castings on average contain about 1% N, 0.5% P, and no K. (Whether or not my castings match this analysis I don’t know; I chose not to pay for an analysis.) Worm castings probably contain some sulfur as well, but I could not find any information on their sulfur content. Having decided on two materials I could use for part of the re-mineralization formula, I thought about how to determine if using them instead of the purchased amendments would be effective for re-mineralization. If I wanted to do a proper experiment, I would need to include a control area where I used the usual ingredients as well as an experimental area where I tried their substitutes. The best choice was the three beds of popcorn I planned to grow in 2018. Thus, for all of the other beds except those growing beans and peas I used a mix with cottonseed meal, soft rock phosphate, dolomitic limestone (for the Mg as well as Ca), potassium sulfate, and borax for re-mineralization in 2018. For the three corn beds I could use that same mix on one bed as the control, with the other two beds available for the experimental mixes. Then I could compare the appearance of the corn plants as they grew and calculate the yields for each bed separately to determine the effect of substitution of materials. Here I encountered the first issue in translating theory into practice. The experiment I wanted to do required four beds of popcorn: the control bed, with the same mix as the other beds; one bed with worm castings substituting for the seed meal but all other ingredients the same; one bed with wood ashes substituting for all of the limestone and potassium sulfate and some of the rock phosphate but all other ingredients the same; and one bed with both the wood ashes and the worm castings, with enough of the other ingredients to make up the remaining deficiencies. But I planned to grow only three beds of corn and did not have room to add a fourth bed. Furthermore, one of the three beds was a newly formed bed that had been planted at different times to asparagus and raspberries and, most recently, had contained weeds for a few years. I hadn’t taken a soil sample from that bed so I didn’t know how similar or different it was to the rest of the garden. After much thought, I decided to re-mineralize the reclaimed bed as if it had the same set of deficiencies and excesses as the grassy areas surrounding the beds, which I sample each year as controls along with the garden soil. In that way I could test it against the control. In the remaining bed, I used both the worm castings and the wood ashes and enough of the other ingredients to make up the remaining deficiencies, based on the fall 2017 soil analysis in the figure. In retrospect, I realize the flaw in my design: if the yield in this bed were different from that of the control bed, I would not know which of the two substitutions was responsible for that change. Rather than trying both wood ashes and worm castings in the remaining bed, I should have chosen to try only the wood ashes. I allowed my desire to find a place for the excess worm castings to overcome my scientific judgement, when I could have added them to the compost pile instead. As my mother would say, live and learn … which you’ll notice in future garden science posts. Beyond this theory-level flaw, I ran into difficulties I hadn’t anticipated when I attempted to prepare the mix with worm castings and wood ashes. While I usually apply compost and the re-mineralization mix separately and then cultivate the soil a few inches deep to mix them in, the castings were so wet that I thought it would be preferable to mix them with the compost and wood ashes and then spread the mix. However, the mixture proved to clump together unevenly and the mixing step took far too long to be practical. This is where I should have taken a deep breath and dropped the worm castings out of the experimental design altogether. But, still being determined to include them, I persisted long enough to drop clumps of mixed worm castings and compost over about 1/6 of the bed area before I gave up on the castings as too heavy and wet to work as a practical nitrogen source in garden beds. That left the wood ashes. Until I worked with them, I didn’t realize how light and fluffy they are; I couldn’t mix them evenly by hand with the rest of the ingredients. In the end, I cast the wood ashes, compost, and re-mineralization mix with seed meal onto the remainder of this bed and worked it into the top few inches of the soil as I normally do. For the part of the bed with the castings, I added the proper amount of wood ashes and remineralization mix without seed meal before cultivating it. After preparing the control and newly formed beds as I mentioned before, I added popcorn seeds to all three beds on the same day and then cared for each bed in the same way. When I harvested the ears of popcorn, I kept the ears from each bed together so that when I shelled and weighed the popcorn, I could calculate the yield, in pounds per 100 square feet, for each bed. What were the results? First, I didn’t notice any visual differences between the plants in any of the beds until the ears of corn were ready for harvest. By that time, it looked as if there were more and larger ears in the control bed than in either of the other two beds. I didn’t see any difference in pest or disease pressure among the three beds, or any difference in plant color or height except near the end of all three beds that is partially shaded by hazelnut shrubs and is attributable to that shading. I can’t do any kind of statistical analysis on the data because I didn’t set up the experiment to allow for that. But based on the results I obtained, it appears that the yield of the control bed was higher than that of either of the other two beds. The problem is, I don’t know if the yield of the experimental bed was lower because of the change in the re-mineralization ingredients, or because of the practical difficulties I encountered working with the wet worm castings and the fluffy wood ashes. And if it was the change in ingredients, I don’t know which one was responsible, or if it was an interaction between them. As for the third bed, since this is only its first year being re-mineralized and I don’t know if I used the right mix for its soil, I’m not surprised that it seems to have produced a lower yield. There you have it: a real person doing a real experiment, experiencing real difficulties and doing her best to understand the message in the results. And it’s something any of you could have done as well as I did; it only required a good grasp of fractions and percentage, and a basic understanding of the scientific method. Tune in to the next post to find out where I’ll take my quest to use home-grown ingredients for re-mineralization in 2019! Awesome! I'm always impressed with your re-mineralisation soil work, and it is way beyond what I've been able to achieve here. I was curious about the general decline in soil organic matter shown on the table and was wondering about why that occurred. Have you considered that side of the story and what it might mean? Incidentally, 3% organic matter is so much better than industrial agricultural soils which can be as low as 1%. Dunno. The rest of the numbers read like pure gold. Wood ash is plentiful here, and humans have used it on the soils down here for millennia. I tend to sprinkle it around the farm from a galvanised bucket in places where I feel that the plants need the minerals, but I do the same with the coffee grounds and husks which I have a huge supply of. Bulk minerals are very hard to come by down here, but mulches, rock crusher dust and manures are quite readily available at reasonable prices. So I have to chuck the stuff onto the ground and hope that the soil life knows what it is doing. And I am always in awe of your soil tests. I hear you about contributing the two different inputs, but still I reckon you might be able to draw some general conclusions from your experiments? There is a fine balance with experimenting whilst also producing an output from the garden. I face that issue with the seed saving because it reduces the produce from the garden and additionally slows the timing of replanting the next crop – and if the weather deteriorates I can be caught out. I've been giving some thought to some sort of building for raising seedlings in so that I can run both strategies (seed saving and getting the next crop started). Dunno. Not sure about your part of the world, but here it takes about three years of work to produce resilient soil for growing annual edible plants. And the longer I stick at the work, the more friable the clay soil becomes and the more water it holds. It is complicated stuff. Thanks for the compliment! I'm helped by being comfortable with and good at basic math and in having two chemistry degrees. To discuss the organic matter issue, I have to bring in precision and accuracy and the fact that when scientists use these terms, they mean different things. Precision means how close the result of the same test repeated on two identical samples is. The report I'm given from the lab implies that the precision of the test is in hundredths of a percent (the smallest of the three figures reported) but I doubt it's that precise. In fact, Erica Reinheimer and Steve Solomon say that the reported organic matter level on two different samples of the same soil, sent to the same lab and done the same way, can vary by a factor of 2! (In other words, the OM could have read between 1.5% and 6% for the spring 2019 sample, so reporting it to three significant figures doesn't make sense.) Accuracy, on the other hand, means how close the experimental result is to the "true" value (I put quotes on "true" because there is no way to know what it is). What I read from the data is that the OM % has remained roughly the same, somewhere in the 2-6% range, during these several years, with minimal compost application. Hot, humid summers burn up OM so I am probably near the maximum OM that my soil can hold. Still, if I can make more compost or find another source of OM to add, I'll use it and see what succeeding soil samples say. As it happens (and I'll mention this again in the next post), I applied wood ashes and seed meal to the bed with the garlic and potato onions last autumn before I planted it. While I don't have a control bed, I can and will draw some tentative ideas about using wood ashes from that bed. Since my soil was already pretty good (thank you, glaciation processes) before I raised a garden on it, I can't tell you how long it would take for someone in the US on soil comparable to yours to make it better. The data above suggest that it only took two years to correct the ratio of calcium to magnesium in my soil but much longer to get the phosphorus level up. I'll have more to say about this in the next post. I am so haphazard with the garden soil here. It hasn't been tested since about the time we moved in here 27 years ago. You can imagine how much it has changed - I hope. We do have a copious source of cheap ($15 a pickup truck load) composted manure from the livestock market in the next county, though you do have to haul it yourself. Each year we add wood ash from our fireplace and wood stove. And thanks so much for the analysis of the wood ash. You mentioned that you have acidic soil (ours is, too) and you seem to have basically the same trees, so I'll bet that analysis applies to our ash also. I just bought a bag of rock phosphate; I usually try to add some of that. Every now and then, maybe every 3 years, we add some magnesium sulfate (Epsom Salts). I had not thought of adding boron; that certainly sounds like a good idea. I only add lime to the soil of plants that are on my pH list of those that need a more alkaline pH. We do make compost from kitchen scraps and garden refuse, and grass clippings and leaves. It doesn't end up as very much, though, and I hoard it for plants that especially need a boost, or for favorites like a special rose bush. What is your worm bin like? How big? Are you feeding them your kitchen scraps? In the garden we have planted: Seeds of lettuce, chard, radishes, and spinach. The lettuce and radishes and peas are up. The squirrels are causing havoc digging in the beds for the last nuts, except in one bed that has the garlic we planted last summer (which stayed green all winter). There are also radishes and peas in that bed - though I have some chicken wire over the peas - and it has not been squirrel-handled at all. I don't think it is just a coincidence, but am going to sprinkle some overripe garlic cloves from last year's crop in a test bed elsewhere to see if maybe squirrels are like vampires. It sounds like you have a good feel for your soil and what it needs. If you want to find out more about it, you could take a sample (a pint or so is enough) and send it to your state Extension's soil testing office, or to Logan Labs. Each of them will tell you how to take the sample and submit it, and what it will cost. If you do that and want some help interpreting the results, I'll be happy to look at them. If you decide to add borax (a source of boron), be very careful about how much you add. It's easy to add too much, so make sure you measure the square feet of the area where you want to add borax. This year I'm adding 2 teaspoons of borax to a 100 square foot bed - you should follow the same proportions. Dissolve the borax in some hot water and then add that water to a watering can, fill the can with plain water, and water the entire area from the can. I always water with another watering can of plain water, nothing else, after that, to make sure the borax water enters the soil. My worm bin is one of those blue Rubbermaid boxes with holes drilled in the bottom. I feed the worms some of the kitchen scraps (they can't eat all of them), with the rest of the scraps and weeds going to the compost pile. The new lawn mower I bought last year has a bag, so I may be able to catch lawn cuttings and shred leaves to make more compost this year. It's time to get the mower operating again! I direct-seeded two pea varieties, only one of which came up, so I re-seeded the other one. Otherwise, I haven't planted anything yet, though I have plenty of seedlings ready for planting and expect to start planting them next week. Good luck with your garden! Forget garlic as a squirrel bane. They are now in that bed, too. They have dug up about half the lettuces and radishes in their search for the last nuts (I could have told them there were no nuts as I had just dug up those beds . . .). I am trying a trick that I think Lew mentioned last year: Setting plastic forks with their prongs upward all over the bed. It looks like some medieval torture contraption. I am very glad that I have been saving forks from Chinese take-out for so long. Good luck with the plastic forks as squirrel banes! I'm sorry to hear garlic didn't work. It would have served them right if it had. It's not like they don't have their own food, but no, they have to eat ours too. My husband Mike and I began our practice of voluntary simplicity in 1994. It has prepared us well for the current predicament brought about by the end of cheap energy and the resulting economic and environmental difficulties. Perhaps some of the things we've learned will be helpful to you as well. I write all the material in this blog and take all the photos you see in it. Respectfully written comments addressing a particular post are welcomed, and I will respond as I have time. All comments are moderated; only those comments that follow the guidelines stated in the previous sentence will be put through. Copyright Claire L. Schosser. Watermark theme. Powered by Blogger.